CHSRA talks about “World-Class” HSR in their Business Plan 2014. 2008 Prop 1A was about “Safe, Reliable” HSR. HSR with grade crossings is neither safe nor reliable. Even on track at only 79 mph they can be disastrous. I have called CHSRA’s attention to the Bourbonnais, Illinois, Amtrak train collision 15 years ago, where two locomotives and 11 of 14 passenger cars were derailed, 11 passengers were killed, and 122 injured. That was about two years before 9/11/01, when terrorists hi-jacked commercial airplanes and killed nearly 3000 innocent civilians. I shudder at what they could do with HSR. Several years ago I wrote authorities about that fear, but it seemed to get no response. 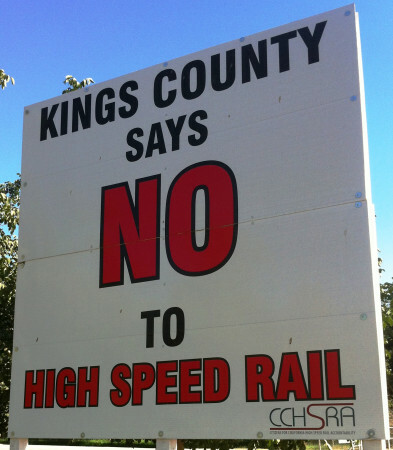 2008 Prop 1A was “The Safe, Reliable High Speed Passenger Train Bond Act…” HSR operations on railroads with grade crossings are neither safe nor reliable. They are vulnerable to accident, sabotage, and severe train delays. Usually the railroad would incur only minor damage, but not always. Witness what happened in Bourbonnais, Illinois, 15 years ago. An Amtrak train on 79 mph track (like at Caltrain) hit a heavily-,loaded truck, derailing two locomotives and 11 of 14 cars, with 11 fatalities and 122 injured passengers. See the pictures in Wikipedia. About two years later, suicidal terrorists commandeered four commercial airplanes and killed nearly 3,000 innocent civilians on September 11, 2001. In today’s world, grade crossings are hazardous, especially on high speed track. Imagine what terrorists could do! CHSRA plans to use Caltrain tracks, despite their dozens of grade crossings. Despite my oft-repeated pleas in my 90 seconds at CHSRA meetings, they barely mention grade crossings in their BP 2014. With the much faster HSR trains CHSRA would run, the dangers of grade crossings would sky-rocket. Hence my request that CHSRA avoid “Blended Rail” and end their initial operations to the Bay Area at San Jose. Transfers there to Caltrain, Capitol Corridor, and the planned SV-BART line would serve the region far better, with lower risk, and at lower cost than Blended Rail and its “one-seat ride” to a downtown San Francisco terminal. Future HSR could well upgrade and follow the Amtrak East Bay route via Mulford and on to Sacramento. From an intermodal transfer station at the BART overhead in Oakland, BART trains about every four minutes would reach the four downtown San Francisco in six to ten minutes. Demand total grade separation for HSR. Don’t squander more HSR money on “Blended Rail” and Caltrain. Truncate HSR for now at San Jose. Plan future HSR from San Jose along Amtrak’s East Bay route to Sacramento. Include a transfer station at the BART overhead in Oakland.